This morning I found the gapingvoid daily cartoon #7 (The new incarnation of Hugh MacLeod‘s Crazy Deranged Fools Newsletter) in my inbox. Every story that works is a story of great distances and starlight which takes place in a moment of mania and is of deep delight. Milch said this during a series of lectures on “The Idea of the Writer” which he held over the course of five days at the WGA theatre. 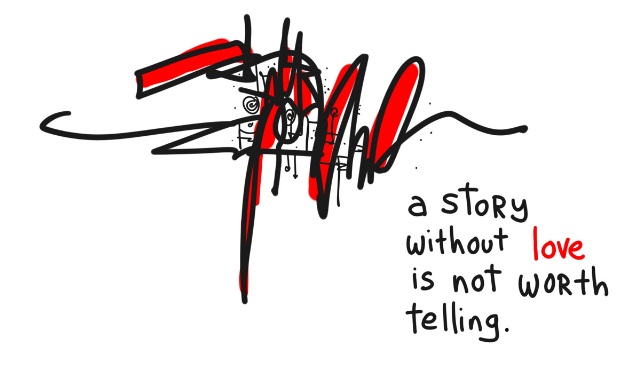 To me this short quote collects all the pleasures of storytelling, be it as an author or listener. And allthough I do not see starlight just yet, this travel (from a cartoon of blogger Hugh MacLeod in 2010 to the lecture of screenwriter David Milch in 2007 to the poem of Robert Penn Warren in 1969) surely was of deep delight.